Is there anything non-phone related that's legitimate? I currently work for a call center and hate constantly being on the phone! Hi Hope – I know where you’re coming from. I used to be a prior authorization nurse for Medicaid. I was on the phone all day approving nursing visits and medical equipment. Not only was it exhausting, but it made me want to crawl into a cave at the end of the day. 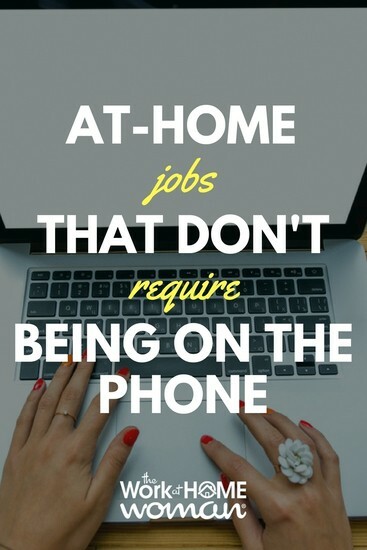 Fortunately, there are lots of jobs that you can do from home without having to be on the phone. Here are 20 different types of work and respective companies that hire telecommuters — no phone work required! Good luck and keep us posted on your work-at-home journey. If numbers and organization excite you, then bookkeeping may be right up your alley. Help business owners organize and input their monthly income and expenses. Some of these companies do require experience or an accounting degree to apply, check them out for more details. Interested in becoming a bookkeeper? Here's a free training program to check out! Do you enjoy assisting people, but prefer not to be on the phone? Provide customer service detail via live chat and email. Most of these companies require individuals to be proficient typists. Check out this post for more chat jobs! Data entry is one of the most common work-at-home jobs that I receive questions about. In fact, I was hesitant to even include them due to the fact that they pay so little – I’m talking pennies per document. But here are a couple to check out if you’re dead set on doing straight data entry. Looking for more typing jobs? Check out this post for jobs for fast and accurate typists! From blog posts and newsletters to articles and advertising copy people are always looking for writers. Check with some of the major freelance sites, like Upwork or Problogger and see how you can offer up your writing services. Need more places to find paid writing gigs? Check out this massive list of sites that pay writers! Short tasks or micro-tasks are just what they sound like – jobs that take a short time to complete, often only minutes. Payouts and functions (watching videos, testing websites, internet searches, etc.) vary greatly, so make sure to check out these sites to see what’s available. Need more ideas? Check out this post for a big list of short task companies! Online competition is fierce, so companies are getting creative with how they reach consumers. Instead of spending marketing dollars on traditional advertising, brands are reaching out to consumers in unique ways, like smartphone apps. The great thing about using your smartphone to make money is there are real customer reviews for each app, so you can get a better idea of which ones are legit and which ones to stay away from. Here are some more ways you can make money with your smartphone. There are many legitimate websites where you can offer your opinion in exchange for cash, rewards, and sweepstake entries. While you’re not going to get rich from participating in surveys, it is a fun way to share your thoughts on products and services, and you’ll receive compensation your time. Interested in completing surveys for money? Here are 16 other survey panels to check out. Do you have excellent listening skills? Are you a fast and accurate typist? Then help businesses transcribe audio files into written documents. See this post for more about general transcription and companies that hire for these remote positions. Do you have a thorough understanding of the English language? Do you enjoy learning about other cultures? Then consider working as an ESL instructor. Here are a couple of companies that hire independent contractors for this position. Search engine evaluators to provide feedback to development teams to ensure that internet search results are accurate and relevant to the search query’s intent. Here are a few companies that hire for this role. Do you have an eagle eye? Do typos drive you crazy? Then consider working from home as a proofreader. Most positions are freelance, which means you have a flexible schedule and you can take on as much work as you're able to handle. Interested in becoming a proofreader? Here's a free training webinar to check out! If you love working online, consider working as a community moderator. In these positions, you'll oversee forums, online groups, and social media accounts to ensure that rules are being followed, questions are being answered, and spam and junk content are being removed. If this sounds like a fun opportunity, check out the companies below. Did you know that companies will pay good money to ensure that their websites are user-friendly? It's true! While you're not going to get rich completing website audits, it is a simple and flexible way to make some extra cash. You don't need a phone to complete these assignments, but you will need a laptop with a webcam and microphone to record your findings. If you'd like to get paid to test website for usability, check out the companies below. Are you a social butterfly? Do you have excellent written communication skills? Then consider working from home as a social media content specialist. As a social media manager, you'll be managing companies' social media accounts, curating content, and providing customer service online. Do you love surfing the web? Are you great at finding the needle in the haystack? Then consider working as an internet researcher. In this role, you'll be completing research tasks for various individuals, companies, and businesses. Do you have a marketing or advertising degree? Do you have previous marketing experience? Then use your skills and knowledge to land a marketing position. Here are a couple of companies that regularly hire for these remote positions. Are you a math whiz? Tutoring can be an excellent home based business opportunity, especially for those people who have an extensive knowledge of a subject; such as a college student who is majoring in English, a school teacher, or a person who is fluent a foreign language. While these positions don't require being on the phone, they do require face-to-face interaction via a webcam or online software like Skype. Do you love fashion? Are you a creative individual who has an innate sense of style? Then try your hand at online personal styling. In this role, you'll curate a set number of clothing items and accessories based on the client's personal fashion profile. Do you have an eye for execution and detail? Then maybe working as a freelance image reviewer or editor is your calling. These positions require some experience but are perfect for individuals with a creative flair and they can be completed 100 percent online. Are you a visual learner? Can you type quickly and accurately? Then consider working from home as a closed captioner. In this position, you'll view video clips and transcribe the audio portion into text — no phone work required! Here are a few hiring companies to check out. This is just a glimpse of some of the work-at-home jobs and opportunities that don't require you to be on the phone. For some more ideas make sure to check our article, 99 work-at-home career ideas for women. Or if you have a suggestion, please leave it below for all to learn from. Originally published February 5, 2014. Content updated December 11, 2017. Hi. Thanks for this blog. I’d love a WFH that truly pays the bills, no phines, chat would be awesome..I never thought of that. And something where I maybe won’t have to.work nights.and.weekends. my current job is set.that wat and I love.that. how will I know.if I get a.response her just come.back amd check? Honestly, I work from home via Swagbucks! I spend a few hours a day on it, just in between my regular web surfing. It’s not a get-rich-quick thing. But an easy way to have an extra $150-$200/month. And join Swagbucks Swaggernauts FB group for tips/help from other “Swaggers”. Hello, I dont know what I did wrong but it did not work for me money wise……It just seemed to keep going and going with no returns. Dont you have to purchase stuff? Hello, I am looking for a work at home job that doesn’t require working over the phone. I don’t want to be an independent contractor. Also I am in college, so I need something really flexible, maybe something that I can choose when I work. If anyone here could tell me a few companies that match my description, that would be great! Thanks. I need a job but without any time conditions….. I would like to apply? Hi Jenny, Click on the link of the company you’re wishing to apply with and visit their career page. Good luck and keep us posted! My wife did this. She started doing taxes and data entry. There are other opportunities work online as well. Holly, where do I find real, legit automated systems? Automated systems for what? Claims of automated work-at-home businesses and jobs are usually scams. If it sounds too good to be true — it is! but how can I apply this?